If you have a website that accepts online payments and wants to expand your business reach by offering new payment options, then you can definitely consider Bitcoin payments. This virtual currency has been a constant source of interest and has stirred a passionate online debate since it introduced itself into the mainstream a few years ago. In this article, we are going to discuss bitcoins and guide you through the process of creating Bitcoin payment gateway and integrating Bitcoin Plugins on your WordPress site. Let’s start by getting an idea of what Bitcoin actually is. Bitcoin is a cryptocurrency developed in 2009 by an anonymous individual that goes by the alias – Satoshi Nakamoto. By Cryptocurrency we mean it’s a form of digital currency. It does not have any physical form, which might appear a bit confusing to most of us since we all are accustomed to the use of paper currencies. Bitcoin transactions are made with no middlemen, which means no banks or financial institutions. No transaction fees are involved and you make or accept payments as an anonymous person i.e without revealing your identity. It was announced in an email circular that bitcoins are a way to liberate money in a similar way as to how the internet made information free. Even though bitcoin is often associated with scammers in the past, who want to make some illegal money while hiding their identity, the impact of bitcoins has increased considerably in the last few years with more people accepting it a mode of payment and it gaining more mainstream acceptance. The value of a bitcoin varies and is not constant. Sites such as Coinmarketcap can be used to check the daily value of bitcoins. Currently, there is more than 2 billion dollars’ worth of bitcoins in existence. The process of creating bitcoins is highly complex and involves various mathematical functions. Bitcoins will stop being created when the total number reaches 21 billion coins. A blockchain is simply a record, a ledger of all bitcoin transactions that has ever taken place. It includes all confirmed transactions, commonly referred to as “blocks”. When a block enters a system, it is broadcasted to a peer-to-peer Bitcoin network of users(miners) for validation. The blockchain is a distributed database, where a copy of the ledger file is being shared among thousands of participants, globally, also called miners. Approximately, 6 times an hour, a new group of accepted transactions, blocks, are created and added to the blockchain. Bitcoin mining is a record-keeping service done through the use of computer processing power. This process involves making your computer work round the clock to solve certain mathematical and cryptographic bitcoin problems.Each such problems have a set of possible 64- digit solutions and it might take days for a single general purpose computer to solve a single Bitcoin math problem. Miners are rewarded in bitcoin by using a sophisticated software to solve complex mathematical and cryptographic problems. Anyone can become a miner by downloading the open-source Bitcoin software. Miners keep the blockchain consistent, complete and unalterable by repeatedly verifying and collecting newly broadcast transactions. They are rewarded with newly created bitcoins and transaction fees. A transaction is a transfer of value between Bitcoin wallets that gets included in the blockchain. Bitcoin wallets keep a secret piece of data called a private key or seed, which is used to sign transactions, providing a mathematical proof that they have come from the owner of the wallet. The signature also prevents the transaction from being altered by anybody once it has been issued. All transactions are broadcast between users and usually begin to be confirmed by the network in the following 10 minutes, through a process called mining. Before diving deep, it is worth mentioning that for making bitcoin transactions, you will need a digital Bitcoin Wallet, think of it like a sort of digital bank accounts. These digital wallets do not store actual currencies, and all that exists are records of transactions stored on the blockchain. Digital wallets are basically software programs that store your public and private keys and provides an interface to conduct transactions. Simply said, during a transaction, if the private key stored in your wallet matches the public address, the balance in your digital wallet will increase, and the senders will decrease accordingly. There is no actual exchange of coins. However, Bitcoins can be converted to regular currency if you decide to do so, which is actually one of the biggest advantages of a Bitcoin Wallet. 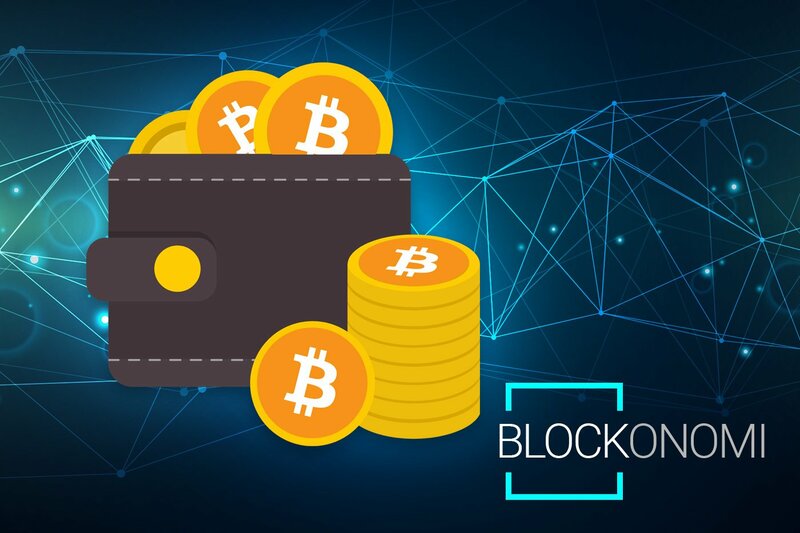 Because of the valuable nature of Bitcoin, it is recommended to purchase a Hardware Wallet which offers extra security for storing bitcoin. The whole meaning of decentralized is not under the control of a single individual. Bitcoin is a decentralized currency, as in no government or any individual or group holds authority over it. It has no geographic limits and can be used for making payments anywhere in the world as long as the receiver accepts bitcoin payments. And hence, It is also often dubbed as the Currency of the internet. Bitcoin transactions are anonymous but to a certain extent. It does not carry personal information from the buyer, which also means that the sales are final. The identity of the Bitcoin users and Bitcoin wallets, as well as the addresses created for bitcoin transactions, are all private. However, bitcoin transactions are public and are permanently stored on the Bitcoin network. Bitcoin is completely digital cash system and so does not require a third party banking system to process the transaction. It involves a peer-to-peer network which is managed through a digital network known as Bitcoin blockchain, which is basically a public-ledger that keeps a record of all the transactions that ever took place. The information stored is publicly viewable on Blockchain.info and is non-editable. Bitcoin transactions involve significantly less or no processing fees, in most of the cases.You can send $10,000 worth of bitcoins with just a nominal fee of about $0.5. Also, the transactions do not require any paper works as is the case with bank transactions. Bitcoin transactions are generally fast and takes place in a matter of seconds. The bitcoin network uses a highly secure protocol that uses advanced cryptography techniques to ensure that the transactions remain secure. The transactions are irreversible and as such, there is no possibility of refunds. Bitcoins are highly volatile and its value fluctuates at an unpredictable rate. Also since there is no governing body, you are solely responsible to protect your money from fraud scams. It is not widely accepted as it is still in its development stage. Using bitcoins requires you to have some knowledge about it, especially about keeping the Bitcoin wallet secure. While you can purchase Bitcoin on Exchanges such as Binance, you can also receive it directly from your customers which is where a service like BitPay comes in. Bitcoin gateways function as traditional merchant accounts allowing you to process a bitcoin transaction just like you would process a credit card. It’s a fairly simple process that requires no technical expertise on your end. There are several gateways to choose from. 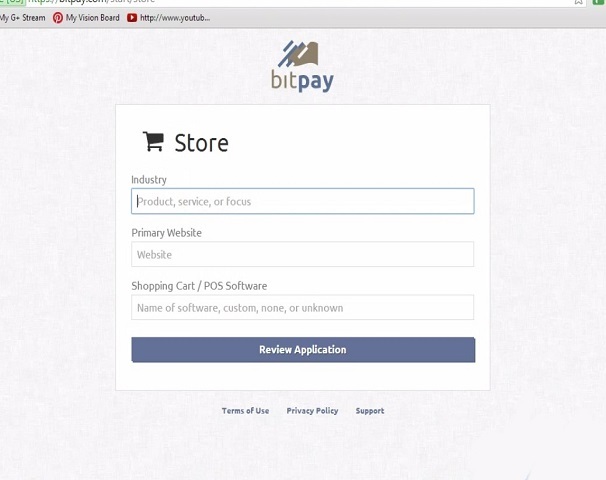 In this article, we will take a look at the BitPay Payment Gateway. Get next-day settlements into bank accounts in 32 countries. Facility to embed invoice directly onto your website. Supports multiple payment methods like click-to-pay URI, scan-to-pay QR code and copy-paste payment form. It comes with a free plan that supports most of the required activities. A paid plan is also available that offers some added features like phone support and Quickbooks integration. Enter your Business or Charity name and your contact Email address. Put in your address and click Continue once you are done. Review your information and if everything is intact, check the Terms and Conditions box and finally click on Submit Application. 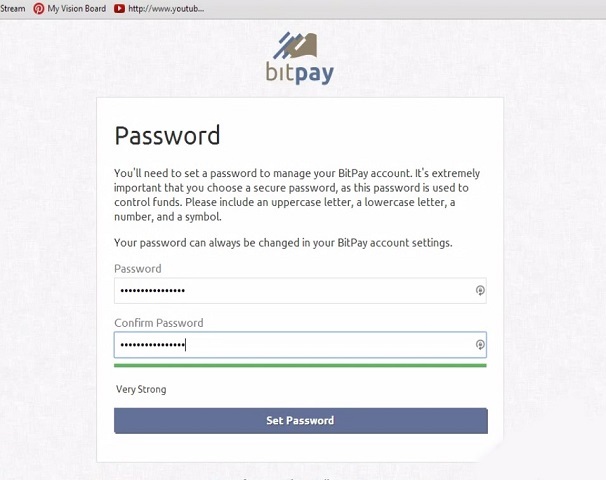 You will get an email from BitPay to confirm your email account. Click on Confirm Email button on that mail. 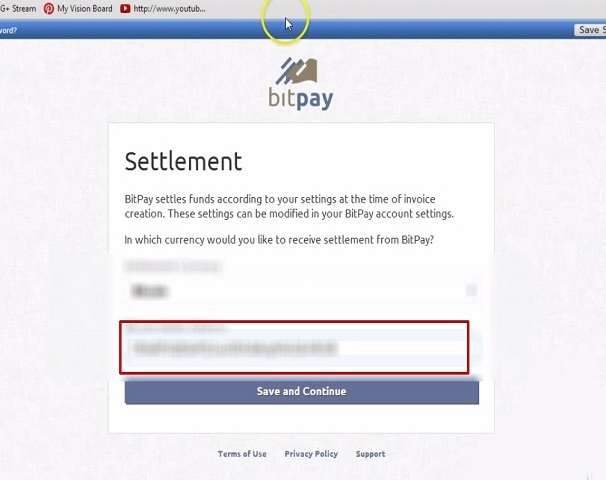 After your email has been confirmed you will get another Welcome mail from BitPay. 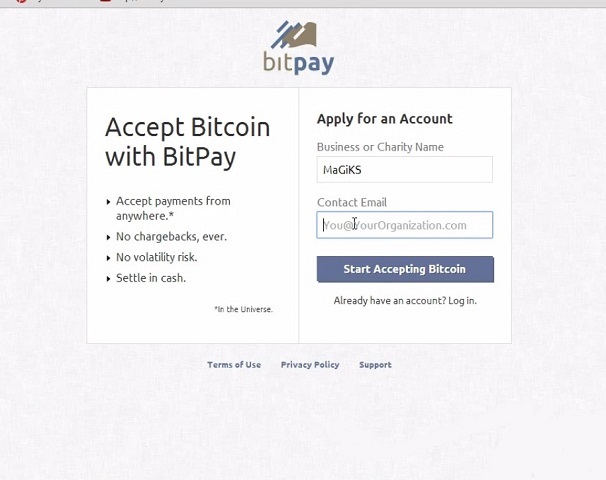 Click on Get Started with BitPay to start using BitPay. The next step involves setting up your currency that you want to receive payments in. Choose the appropriate option accordingly. In case you choose Bitcoin as your settlement currency, you will also need to provide your Bitcoin Wallet Address along with it. 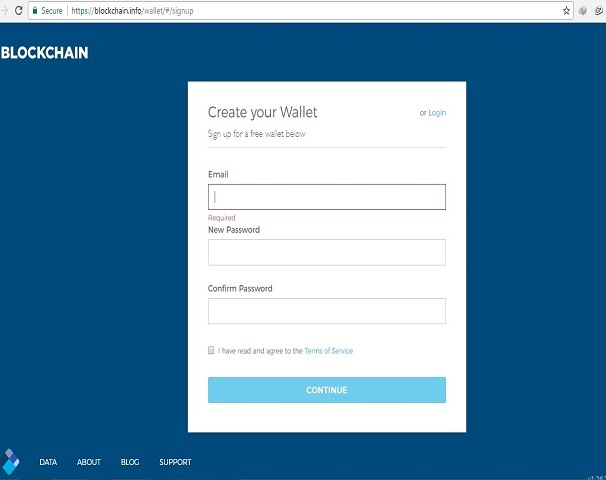 If you haven’t created a wallet yet, here are the steps for creating one. 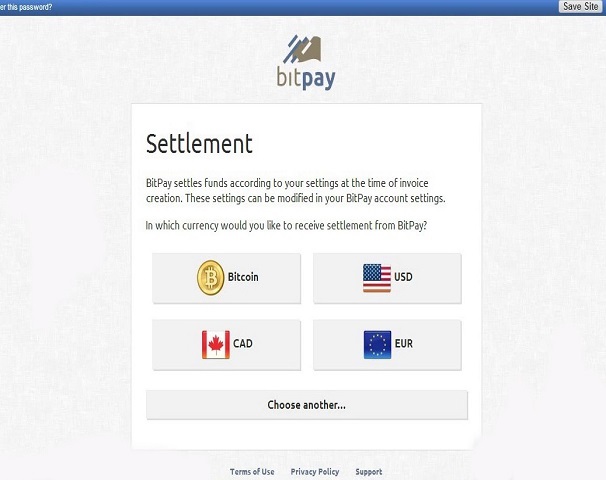 There are several wallets out there to choose from, just make sure the one you choose is compatible with BitPay. 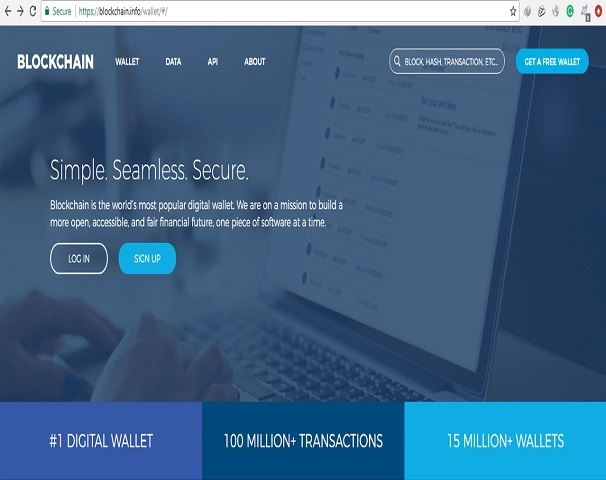 Visit the Blockchain site and click on Get A Free Wallet. Verify your email address, and then log in to the site and copy out the provided Bitcoin wallet address. You will then be directed to a Thank You page. Click on Login to Dashboard. Click on My Account, under My Information Section. Once the API key has been created, BitPay will use this API key to authenticate your API connections. Your API key must always remain private and if it is compromised, you should create a new API key. To enable your WordPress website to accept bitcoin payments, you will require Bitcoin Plugins. These plugins will also convert your bitcoins into other currencies There are several plugins that you can choose from. These plugins allow you to accept bitcoins as payments in your site or even just receive donations in the form of bitcoins. This plugin gives your website the ability to accept bitcoins as a payment form on your WordPress site or even accept donations. This plugin is BitPay compatible, has a lot of functionalities and a user-friendly interface. Automatically convert your store currency to bitcoins via flexible exchange rates and with no hidden charges. Accept payments in bitcoins from any country in 150+ currencies. 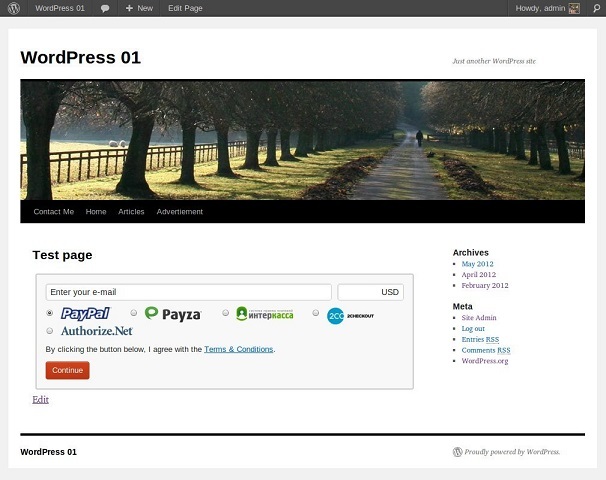 Installation of the plugin involves the same set of steps as with installing any other WordPress plugins. Login to your WordPress dashboard and in the search bar, type “WordPress Bitcoin”. Select the plugin, click on Install now and finally activate the plugin. After successful activation, a WP Bitcoin menu is added inside your Settings tab on your left sidebar. A Bitcoin Orders menu is also added to your left sidebar. Check the box that reads “Enable BitPay” and paste your BitPay API access key. 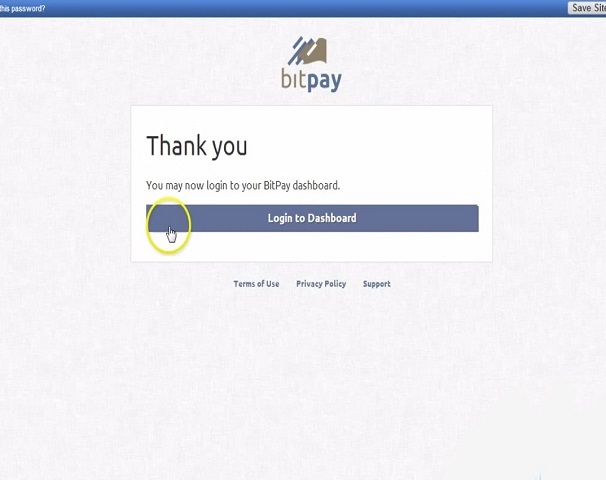 You can obtain your API access key by login into your BitPay account and copy the access key from there. Set your transaction speed, order information page and order information page title. Modify the item_name, price, and currency as needed. The value that you set for your price and currency will be converted to the current Bitcoin market value. This plugin is highly efficient, as its sole purpose is processing bitcoin transactions. It uses a fully automatic cryptocurrency processing platform and invoice system for hassle-free bitcoin transactions. The payment amount is calculated using real-time exchange rates and many others. Before installing the plugin, you need to create an account on the Coingate official website. You will also need to generate a set of API credentials, which will be required in the following steps. Installing the plugin is the same as mentioned above. Search for “Coingate” and when the plugin appears, install it and then activate the plugin. Set the Receive Currency to the currency in which you wish to receive your payouts from Coingate. You can also set the Coingate order statuses. Formerly known as Donate & Demand is a premium Bitcoin plugin that works well with digital products. 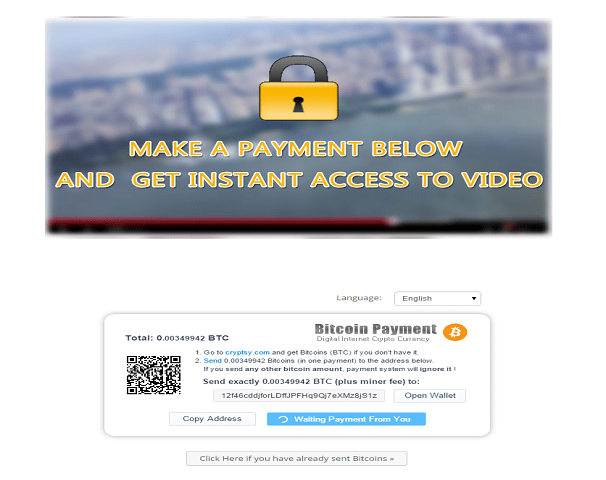 It supports various payment gateways such as PayPal, Stripe, and BitPay for accepting Bitcoins. After a transaction has been processed, customers will instantly get a link to their digital product. Shortcode driven and much more. Auto-synchronization between payments data stored in your GoUrl.io account and your website. 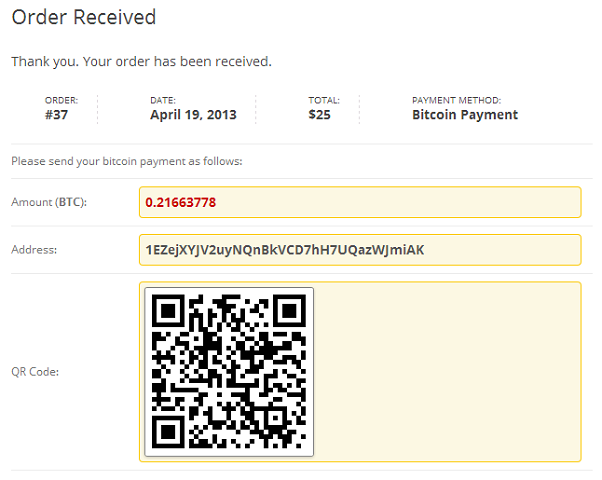 Bitcoin Payments plugin allows you to accept Bitcoins to sell physical and digital products from your online store. Once you have WooCommerce plugin installed on your site, then you may install and activate Bitcoin Payments for WooCommerce. Full support for Electrum 1.x and 2.x Master Public Keys(MPK). Automatic conversion to bitcoin via real-time exchange rate feed and calculations. 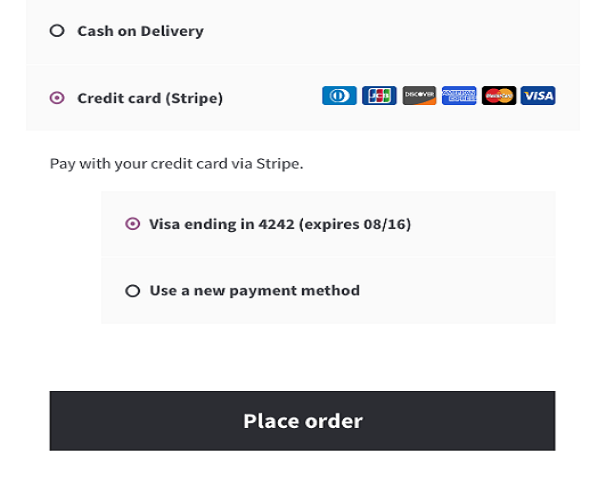 The WooCommerce Stripe / PayPal plugin lets you accept payments on your website using credit cards or bitcoins via the Stripe Payment Gateway. It provides a smoother and hassle free experience while making transactions. Basic currency conversion provision included. Since its establishment in 2009, Bitcoin has raised a lot of controversies. Many argue that it has the potential to disrupt the existing financial system. Also, it has been used for many criminal purposes like gambling, money laundering, purchasing ammunition and so on. It’s primary feature of not revealing the user’s identity, as well as the lack of a central governing authority, has been exploited by many. That being said, Bitcoin has its own advantages like no middleman, or zero transaction fees and so on. This makes sending money internationally cheaper, easier and faster. Also, the entire Bitcoin network is very secure and it ensures that money goes to/comes from the right person. All these facilities will definitely help in the growth of Bitcoin and it actually has. So needless to say, Bitcoin has its own set of advantages as well as disadvantages. Furthermore, it is critical to note that any alterations to the current infrastructure could radically change the nature of currency and eliminate benefits that it was designed to retain. You will accept bitcoins to your specified address. No registration needed and no KYC. Just use your own bitcoin address. My default woocommerce currency is the Nigerian Naira, but it keeps sending out dollars to the BitPay plugin, which automatically bars me from receiving payments, since 1000 Naira(about 4 dollars) is read as 1000 Dollars. Is there a way to deal with this? Thanks for sharing with us Oliver ! 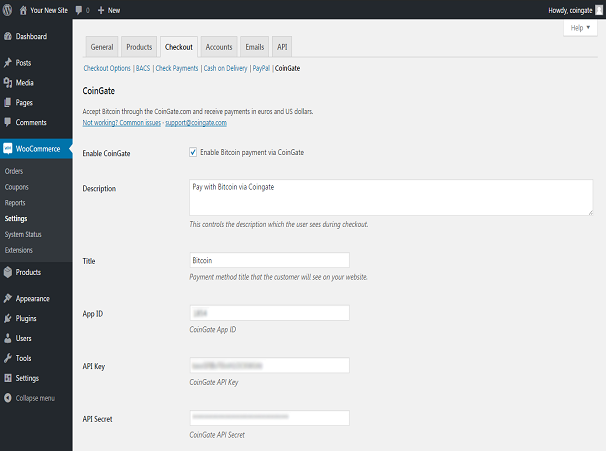 Actually I’ve used GoUrl plugin and it’s really easy to use, complete and safe way to accept Bitcoin on WordPress. Informative post. Bitcoin is a must have in some countries so thanks for sharing the proper guide to use.